Amal Clooney left her SoHo apartment in a skirt set and a pair of heels from the Off-White collaboration with shoe brand Jimmy Choo. Designer Virgil Abloh looked to Princess Diana as a source of inspiration for the plastic-wrapped heels. Hexagonal frame lightweight metal/acetate sunglasses personalized with gold filaments. Too boxy for me – however I have come to the realization that this woman can wear a garbage bag and she can pull it off. By the way this is def not a USA business woman look very European and British – maybe ladies on the other side of the pong think this rocks? It varies by profession. We have no idea where Amal was headed in this outfit so it is not possible to comment on whether it was appropriate or not, and that is always a personal judgment call. It is very simple Mary. In the USA, successful business women (i work for them) don’t give a hoot about fashion, brands, labels, haute couture, being a celebrity, high heels, continuous hair tossing, etc etc and a hell lot more etcs. Here, successful business women do work hard indeed, they do work, and what you wear, what brand and how and where you wear it is totally irrelevant, because what matters is the work. What Amal wears is very expensive, very relevant, very publicized, much more than her work, unless she changed professions already. This is not flamboyant at all – wherever amal was headed its not a common attire that US business woman wear the fact is this type of suit sells much better out of the states hence the designers or words this is usually exclusive to Europe and UK. Those shoes are totally STUPID. I saw these exact ones in a designer website about 4 weeks ago and my first thought was “who would wear them”. My second thought as “it’s something Amal Clooney would wear”. Guess I was right! Why does she need to stop? It’s literally a millisecond in time and I’m sure the press love capturing that moment for looks – they choose the pics they post – I can’t imagine never moving my hair off my shoudmera or even just putting my hair behind my ears – difference is there is a crazy photographer standing there snapping 100 pics in second for her ! In a lot of pictures, her left arm seems to be like holding or protecting her hair, and in other outing pictures is bend like ready to catch the hair/head if it falls. It just looks a bit uncomfortable/weird, like she doesn’t know what to do with the arm, so she softly caress her hair (maybe it makes sense after the long hours of daily hair care she likes to touch her hair .. whatever floats her boat :- ))). All these paparazzi walks make it very hard to take Amal seriously. Why is she so starved for attention? She leads a fabulous life with a good career, loving husband and family, lots of wealth that she can use to really influence people and help alleviate the suffering of many people. Some people say she gets paid by designers to wear their clothes but she doesnt need the money (George is worth over $200 million). Maybe she craves all the attention? So strange and a bit sad. I miss the old Amal. RKM: I agree with everything you say here and have felt that way a very long time. I do believe Amal is very aware of the cameras and on some occasions lets them know where she will be. There is no other reason for her to dress like this on a daily basis. When I say, “dress like this” I mean the different coats every single day, everything put together perfectly, her hair and makeup usually done perfect, the sunglasses at the ready before she even leaves her home, etc… There’s nothing wrong with seeking attention by dressing in beautiful clothes, and that is exactly what she is doing. Good for her. As far as this outfit is concerned, it’s not my favorite. They are very strategic when it comes to them being photographed. If she had integrity she wouldn’t demand the students sign a non disclosure before they had the privilege to hear her speak. Yes she has experience but not the success and seniority they have tried to ram down our throats. Mrs Clooney loves the attention and it isn’t going to stop any time soon. By the way, where are the children? Frost, that non disclosure agreement is being signed also by anyone that work for/with them both. It is routine, especially for high dollar actors or politicians, celebrities, anyone that lives by an “image”.. and she is. In her case, I expect that one day she will sell a book with her “speeches” as well :- ))) wont sell good if students video taped her “class” first, right ? You never seen any video of her conference’s speeches or classes right ? only if they are open public court to the UN. Now that she is “famous” her preference is being paid (nicely paid) when she speaks and of course there is always an agreement signed, no pictures, no recording, no transcript, no press article or they can get sued (George likes to sue very easily) .. There is a whole ton of money and “image preservation” involved in these agreements. There is the fashion met gala very soon where she will be the star. There has to be some advertisement before hand :- ))) surely yall know this. Actors do the same PR parade before same movie opening right ? This is all normal BAU. After the met gala, the call to paps will slow down. Forst: How do you know that every law student at Columbia is not asked to sign a disclosure agreement? 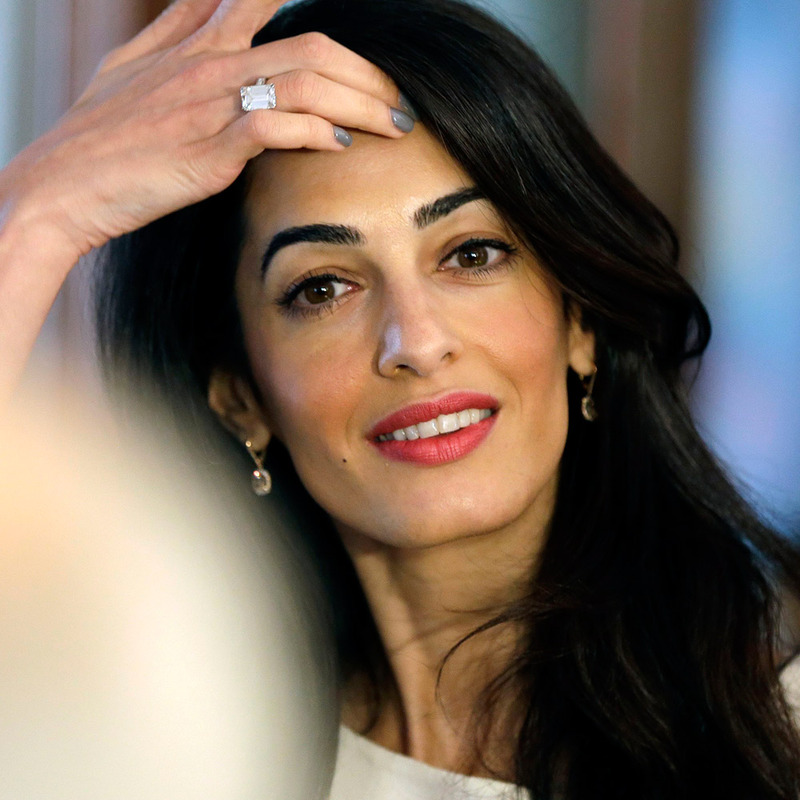 Why would Amal bring her children to work with her? Forst- they totally do have an NDA they signed at the top of the class and it is mentioned in their syllabus. Soos: where on the description of L6276 Human Rights Section 001, Spring 2018 taught by Clooney and Cleveland does it explicitly state that no non disclosure need be signed? Jackson they delivered the syllabus at the first class ( an updated version) and an NDA was included – it’s not the version posted online – maybe they did that on purpose no clue. Love that you took the time and went to the website and pulled this for additional research ! You go Jackson YOURE HIRED! Agree with Nikolai. So no need to consider or think she is going to live a “quiet” life with husband & children and live a life like Caroline Kennedy. Amal has the profile personality of wanting to be seen, announce & publicize the great things she is/or will be doing (like the March for our Lives event) ahead of time, Everyone knew well in advance they would be at that event, UM, because Amal & George publicly announced it. Yet George was unwilling to be interviewed by the students at the High School for their school newspaper. Also, A & G publicly announced they were supporting & footing the bill for the young man to be educated in America. I don’t get the constant public announcements that they continue to make. Many many people worldwide do philanthropic things on a daily basis with no need to announce, publicly broadcast, or gain recognition from doing so. They very much like to point themselves out; whether it’s really important to do so—or not. There is a reason and timing for everything, for all the being in public, outings, pictures, babies, trips, her cases, and their “donations”, Jaclyn. I love, love, love this outfit. To me it is a perfect spring outfit and I think she looks lovely in it. As for the shoes, well, if it rains they won’t get damaged :). I especially love the style, length and flow of the skirt on her! She really can pull off the vintage clothes! This outfit’s a miss. Don’t like the top half – it doesn’t fit her properly and the sleeves look odd. The shoes would have been quaint but the plastic wrap makes them look cheap. Love the sunglasses though. I love this suit. Amal is really by the sixties. One of my favs. The plastic shoes, however, are a bit odd. Just loving her variety of sunglasses! Writer Dale Carnegie wrote this witticism in his 1936 best-seller How to Win Friends and Influence People. It follows a quote from Franklin, hence the attribution confusion. It is actually falsification of information. I see it often in academia at all levels and now with Trump I see it all the time. The person here is so taken with quotes of little relevancy or alignment with the topic of an outfit and did not know where the quote came from and just attributed it to Franklin. The person did the same thing again in the last day or too. I used to see that all the time with high school students so I imagine this person is at that level of education. Nati why do you allow Jackson to promote his hateful commentary? Now he’s even using Trump as a red inflammatory herring to his childish arguments. This is a fashion blog, not the place for Jackson’s dribble. It adds no value, even incremental especially now he is throwing In Trump to rile people. My blog is not a battlefield. Everyone has to respect the others. Jackson you make assumptions when it suits you but argue against assumptions when it doesn’t suit you. The irony is not lost on how “Trumpian” this sounds. Jackson a little weird u first said I see this at all levels in academia then say u see it at high school levels- girlfriend which is it. Honestly I was seeing ur point up until u brought Trump into it – I see that uneducated loose canons that can’t make a point without that comparison all the time in the legal world. Nati, thank you for the time and effort you put into this blog. We apologize in advance for you having to get in the middle of vile and hateful attacks by Jackson. Lol, that’s not plagiarism, it’s just an incorrect citation. Plagiarism is when you try to pass off someone’s work/words as your own. She put it in quotes and cited it; she didn’t claim the idea or use the words as herself. Soos, please explain your interpretation of “Flamboyant”. Shoes wrapped into plastic…. this is normal???? Ok. I have never seen it – not in Rome – nowhere – but interesting how people think here. You can wrap shoes with toilet paper. If they have a prestigious “label/brand” and a very high price, they will be sold and the critique will be that “they are gorgeous and quirky” or .. “flamboyant” .. whatever. Really?! Why don’t we say that when we see George on set or at his work appointments? I agree with your astute observations Soos – “she is stepping out… she just dump them somewhere…. she’s not an attentive parent and attention grabbing for pictures to be taken” – sadly, there is no evidence to the contrary. And yes, societal expectations for a mother will always be different than for the father. If it is true she carried them, then the bond is different. As a species, we have no tradition or cultural memory of mothers abandoning their children at 9 months to work – particularly in Lebanese culture, where family comes first and children are one’s most prized possession. George is (very) white and this is not the same as being Middle Eastern. What we see Amal doing is very Western, very white, very middle to upper class – this is a new motive in motherhood and in her case, it is very much related to choice and very much a topic of interest to a wider audience who may be silly enough to emulate her lifestyle choices. She is not maternal. The children are an accessory to a wonderful life. I am so disgusted by many who are women on this blog asking in a tone HOW DARE THIS BE DAY 5 and she’s stepping out ( for any god damned reason really work or otherwise ) and where are her poor poor twins their mom has abandoned them to catwalk!!! Perfumered- I do not understand your post. What do you mean no evidence to the contrary? Motherhood is defined by each mother in her (or his) or own way. So there was just a party that amal hosted with Anna Wintour in nyc – my cousin was there ( she’s a makeup artist not amals) and her brother his wife and Baria amals Mom were there – she said her family was so kind and were huge supporters of amal – mingling and very kind to one another and Amal Was asked if she would design her own sunglasses line as a joke ————— I HOPE SHE DOES!! !